Major reductions in premature deaths from cancer, and improvements in quality of life and cancer survival rates cannot be achieved without a skilled and supported cancer workforce with formalised expertise in all disciplines of cancer control and at all levels of health service. Developing innovative education and training programmes for cancer healthcare professionals that build on existing materials, training networks and infrastructure is the best approach. Sustained and accelerated progress towards universal health coverage must be linked with specific efforts to strengthen the health workforce. Greater attention is needed to systematically monitor shifts in the character and size of the cancer workforce, to inform new and existing programs, and to advocate for policy changes to address workforce shortages. The world today is short of 7.2 million healthcare workers and without specific efforts to address this shortage, this figure will reach 12.9 million by 2035. While progress is being made towards the basic threshold of 23 skilled health professionals per 10,000 people, there are still 83 countries that fall below this threshold. The pool of skilled workers is also unevenly distributed, with high concentrations in urban areas and many working in the private sector rather than in public healthcare. Whilst the largest shortages in numerical terms are expected to be in parts of Asia, it is in sub-Saharan Africa where the shortages will be especially acute. For example, in the 47 countries of sub-Saharan Africa, just 168 medical schools exist. Of those countries, 11 have no medical schools, and 24 countries have only one medical school. Globally, a failure to take action to address shortages in cancer healthcare professionals will have a lasting impact on the accessibility and quality of care, with delays in diagnosis and treatment; care provided by inadequately trained professionals; fragmentation of services; and worsening of disparities in cancer outcomes. 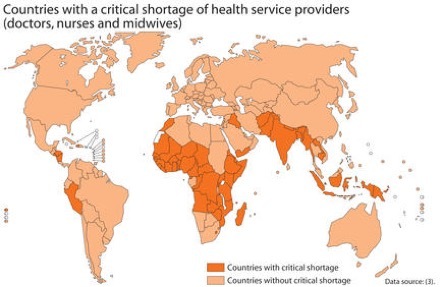 Countries with a critical shortage of health service providers (doctors, nurses and midwives) Countries without critical shortage Countries with critical shortage Data source: World Health Organization. Global Atlas of the Health Workforce. Target population: Investment in continuing professional development (CPD) to equip healthcare workers with the appropriate tools and knowledge to deliver best practice services across the cancer care continuum is vital. This includes building expertise and capacity amongst health professionals to recognise the early signs and symptoms of some cancers, as well as appropriate early detection measures; ensuring the safe and proper administration of chemotherapy and other cancer treatment modalities including radiotherapy and surgery; and delivering palliative care and pain and distress management, to reduce the morbidity and mortality of cancer in all populations. Data Availability: Resources mobilisation: The potential exists to increase the utilisation of Information and Communication Technologies (ICTs) to address the gaps in the training of healthcare workers to equip them with the skills and knowledge to engage in early detection programmes. The concept of optimal tasking for cancer care ensures tasks are both shared among health workers with differing levels of training combined with the shifting of some tasks from specialist healthcare providers to other groups of health workers such as mid-level and lay health providers. This has proven an effective way to engage expert patients, community health workers, clinical health assistants, nurses and physicians working in primary care level facilities to provide more and better access to cancer control and care services at each stage of the cancer control and care continuum.